You are here: Home / People / CBCB Personnel / John S. Garavelli, Ph.D.
More than forty years experience in research and administration in the biochemical sciences, bioinformatic databases and ontologies, molecular modeling, molecular evolution, and information theory as applied in protein science and proteomics, protein encoding, structure, function, modification and evolution. “Structure, Function, and Evolution of Mitochondrial beta-Hydroxyacyl-CoA and Malate Dehydrogenases.” R.A. Bradshaw, B.E. Noyes, B.E. Glatthaar and J.S. Garavelli (1973) 9th Int. Cong. Biochem. Abstr., p. 56. “Structural and Functional Similarities Between Mitochondrial Malate Dehydrogenase and L-3-Hydroxyacyl CoA Dehydrogenase.” B.E. Noyes, B.E. Glatthaar, J.S. Garavelli and R.A. Bradshaw (1974) Proc. Nat. Acad. Sci. USA 71, 1334–1338 [PMID:4133851]. “Sequence Studies on Pig Heart Mitochondrial Malate Dehydrogenase.” M.R. Sutton, B.E. Glatthaar, J.S. Garavelli, L.J. Banaszak and R.A. Bradshaw (1975) Fed. Proc. Abstr. 34, 630, abstract 2334. Part I. Studies on the Structure of Mitochondrial Malate Dehydrogenase Part II. Applications of Information Theory to Protein Structure, J.S. Garavelli (1975) Ph.D. Thesis, Washington University, Saint Louis, MO. Diss. Abstr. Int. B 36 (1976), 4437–4438. “PROB2.JSG” J. S. Garavelli (1976), copywritten FORTRAN program. “PROB3.JSG” J. S. Garavelli (1977), copywritten FORTRAN program. “Exact Calculation of the Frequency of Matches in Sequences with a Variable Number of Gaps.” J.S. Garavelli (1977) Second Chesapeake Bay – Delaware Bay Probability Statistics Symposium, Newark, DE. “Polya Counting Theorem Made Practical: An Algorithm for the Multiplication of General Polynomial Forms.” J.S. Garavelli (1979) Sixth Chesapeake Bay – Delaware Bay Probability Statistics Symposium, Baltimore, MD. “Identification of a Volatile Phytotoxin from Algae.” J.S. Garavelli, F. Fong and E.A. Funkhouser (1983) NASA–AIBS Space Biology Symposium, Arlington, VA.
“Estimation of the Rate of Glycerol 3-Phosphate Dehydrogenase Evolution in Higher Vertebrates.” R.A. Ballas, J.S. Garavelli and H.B. White (1984) Evolution 38, 658–664. “Information Content of Peptide Conformations.” J.S. Garavelli (1984) UCSC Workshop on Protein Folding, Santa Cruz, CA. “Stereoselection of Amino Acids by Formation of Ortho Diesters.” J.S. Garavelli (1984) Gordon Research Conference on the Origin of Life, New London, NH. “Improvements in the Computer Enumeration of Permutation Isomers.” J.S. Garavelli and J.E. Leonard (1985) Computers & Chemistry 9, 133–147. “Airborne Trace Contaminants of Possible Interest in CELSS.” J.S. Garavelli (1985) CELSS’85. R.D. MacElroy, N.V. Martello, D.T. Smernoff, eds., Moffett Field, CA, NASA TM 88215, p. 253–262. “Comments on Papers Concerning Computer Enumeration of Permutation Isomers.” H. Dolhaine, J.S. Garavelli and J.E. Leonard (1986) Computers & Chemistry 10, 239–240. “Computer Model of a Polyribonucleotide Structure Which May Have Functioned as a Catalytic Adaptor for Peptide Bond Synthesis.” J.S. Garavelli and A.L. Weber (1986) 5th ISSOL Meeting and 8th Int. Conf. on the Origin of Life Abstr., 344–345, abstract 203A, Origins of Life and Evolution of Biospheres 16 (3–4), 522 [DOI:10.1007/BF02422177]. “A Proposal for a Standard Format for Molecular Description Files.” T.J. O’Donnell and J.S. Garavelli (1988) Gordon Research Conference on Computational Chemistry, Plymouth, NH. “Requirements for a Standard Molecular Description File Format.” J.S. Garavelli (1988) Workshop on Standards for Exchange of Computerized Chemical Structures 196th American Chemical Society National Meeting, Los Angeles, CA. “Progress Toward a Standard Molecular Description File Format.” J.S. Garavelli (1988) Second Conference on Biotechnology Research Directions: Biomolecules Argonne National Laboratory, Argonne, IL. “An Algorithm for the Multiplication of Symmetric Polynomials.” J.S. Garavelli (1988) ACM Transactions on Mathematical Software 14, 337–344. “The Effort to Define a Standard Molecular Description File Format.” J.S. Garavelli (1989) Chapter 12, pp. 118–124, in Chemical Structure Information: Interfaces, Communication, and Standards, Wendy A. Warr, ed., American Chemical Society, Washington, DC. “Protein Identification Resource Collects Sequence Information, Develops Software Tools for Scientific Researchers.” J.S. Garavelli (1990) Chemical Design Automation News 5(5), 12 et seq. “Why a Standard Format?” J.S. Garavelli (1990) Chemical Design Automation News 5(8), 2 et seq. “The Amiga Molecular Modeling Machine” J.S. Garavelli (1990) Desktop Visualization Workshop, Molecular Graphics Society, Bethesda, MD. “Molecular Modeling on the Commodore Amiga.” J.S. Garavelli (1991) J. Mol. Graph. 9, 24–26 [PMID:2018753]. “The PIR protein sequence database.” W.C. Barker, D.G. George, L.T. Hunt and J.S. Garavelli (1991) Nucleic Acids Research 19, 2231–2236 [PMID:2041808]. “Building International Scientific Databases for the 21st Century.” J.S. Garavelli (1992) seminar presentation, Pasteur Institute, Paris, France. “Protein Database Developments.” J.S. Garavelli and E.E. Abola (1993) Chemical Design Automation News 8(1), 28, 30. “The NRL_3D Database: A Tool for Sequence Conformation Study.” J.S. Garavelli (1993) The Protein Society Symposium, San Diego, CA. Protein Sci. 2 (Suppl. 1), 126, abstract 407. “A Database of Protein Structure Modifications.” J. S. Garavelli (1993) The Protein Society Symposium, San Diego, CA. Protein Sci. 2 (Suppl. 1), 133, abstract 450. “The NRL_3D Database: Cross-linking Sequence and Structure Information.” J. S. Garavelli (1994) American Chemical Society National Meeting, San Diego, CA. “Linking Genomic and Protein Sequence Databases.” J. S. Garavelli (1994) The Protein Society Symposium, San Diego, CA. Protein Sci. 3 (Suppl. 1), 139, abstract 501. “Chemical information in biomolecular databases.” J. S. Garavelli (1995) The Present and Future of Biomolecular Information Databases, symposium chair J. S. Garavelli American Chemical Society 209th National Meeting, Anaheim, CA. “The Protein Information Resource (PIR) and the PIR-International Protein Sequence Database.” D.G. George, R.J. Dodson, J.S. Garavelli, D.H. Haft, L.T. Hunt, C.R. Marzec, B.C. Orcutt, K.S. Sidman, G.Y. Srinivasarao, L.-S. Yeh, L.M. Arminski, R.S. Ledley, A. Tsugita and W.C. Barker (1997) Nucleic Acids Res. 25 (1), 24–28 [PMID:9016497]. “The PIR-International Protein Sequence Database.” W.C. Barker, J.S. Garavelli, P.B. McGarvey, C.R. Marzec, B.C. Orcutt, G.Y. Srinivasarao, L-S. Yeh, R.S. Ledley, H.W. Mewes, F. Pfeiffer and A. Tsugita (1999) Nucleic Acids Res. 27 (1), 39–43 [PMID:9847137]. “The RESID Database of Protein Structure Modifications.” J.S. Garavelli (1999) Nucleic Acids Res. 27 (1), 198–199 [PMID:9847179]. “Prediction Tools for Protein Homology Domain-Associated Post-Translational Modifications in the RESID Database.” J.S. Garavelli, D.J. Miller and G.Y. Srinivasarao (1999) The Protein Society Symposium, Boston, MA. Protein Sci. 8 (Suppl. 1), 75, abstract 107. “PIR: a new resource for bioinformatics.” P.B. McGarvey, H. Huang, W.C. Barker, B.C. Orcutt, J.S. Garavelli, G.Y. Srinivasarao, L.-S. Yeh, C. Xiao, and C.H. Wu (2000) Bioinformatics 16 (3), 290–291 [PMID:10869023]. “The Protein Information Resource (PIR).” W.C. Barker, J.S. Garavelli, H. Huang, P.B. McGarvey, B.C. Orcutt, G.Y. Srinivasarao, C. Xiao, L.-S. Yeh, R.S. Ledley, J.F. Janda, F. Pfeiffer, H.-W. Mewes, A. Tsugita, and C. Wu (2000) Nucleic Acids Res. 28 (1), 41–44 [PMID:10592177]. “The RESID Database of protein structure modifications: 2000 update.” J.S. Garavelli (2000) Nucleic Acids Res. 28 (1), 209–211 [PMID:10592227]. “Hilbert’s Space: aspects of one century and prospects for the next.” J.S. Garavelli (2000) Philosophical Society of Washington Retiring President’s Lecture, Washington, DC [http://home.earthlink.net/~jsgaravelli/MYTALK.HTML]. “Cofactor-binding homology domains of the hybrid cluster proteins and the carbon monoxide dehydrogenase nickel-containing chains.” J.S. Garavelli, H.Z. Huang and D.J. Miller (2000) The Protein Society Symposium, San Diego, CA. Protein Sci. 9 (Suppl. 1), 75, abstract 131-M.
“The RESID Database of protein structure modifications and the NRL-3D Sequence-Structure Database.” J. S. Garavelli, Z. Hou, N. Pattabiraman, and R. M. Stephens (2001) Nucleic Acids Res. 29 (1), 199–201 [PMID:11125090]. “Protein Information Resource: a community resource for expert annotation of protein data.” W.C. Barker, C. Wu, R.S. Ledley, J.S Garavelli, Z.L. Hou, H.Z. Huang, P.B. McGarvey, B.C. Orcutt, C.R. Vinayaka, C.L. Xiao, L.-S. Yeh, F. Pfeiffer, H.-W. Mewes, and A. Tsugita (2001) Nucleic Acids Res. 29 (1), 29–32 [PMID:11125041]. “Studies on the Cofactor Structure and Sequence Homologies of Rhodospirillum rubrum Carbon-monoxide Dehydrogenase Nickel-Containing Chains.” J.-Y. Heo, C. R. Staples, J. S. Garavelli and P. W. Ludden (2001) Protein Sci. 10 (Suppl. 2), 119, abstract 237. “The RESID Database Integrated with an Analytical Platform for Identifying Post-Translational Modifications.” J.S. Garavelli, B.J. Cargile, Y. Li, J. Johnson, and N.L. 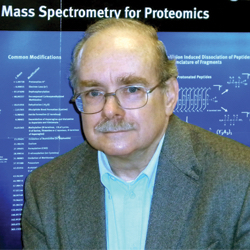 Kelleher (2001) Protein Sci. 10 (Suppl. 2), 111, abstract 212. “The Proteome Challenge.” J. S. Garavelli (2002) Philosophical Society of Washington, 2140th Meeting, Washington, DC. “Hydroxylamine reductase activity of the hybrid cluster protein from Escherichia coli.” M.T. Wolfe, J. Heo, J.S. Garavelli, P.W. Ludden (2002) J. Bacteriol. 184 (21), 5898-5902 [PMID:12374823]. “The RESID Database of Protein Modifications: 2003 developments.” J.S. Garavelli (2003) Nucleic Acids Res. 31, 499-501 [PMID:12520062]. “A Bioinformatic Analysis of Protein Modifications in the RESID Database.” J.S. Garavelli (2003) Protein Sci. 12 (Suppl. 2), 73, abstract 64. “Design Considerations for Swiss-Prot Feature Annotations.” J.S. Garavelli, N. Farriol-Mathis and A. Bairoch (2003) Protein Sci. 12 (Suppl. 2), 126–127, abstract 230. “Automated Protein Database Annotations Based on Family Classification.” J.S. Garavelli, E. Kretschmann, J.F. O´Rourke, A. Hackmann, A. Rakow and R. Apweiler (2003) Protein Sci. 12 (Suppl. 2), 127, abstract 231. “The RESID Database of Protein Modifications as a resource and annotation tool.” J.S. Garavelli (2004) Proteomics 4 (4), 1527–1533 [PMID:15174122]. “Annotation of post-translational modifications in the Swiss-Prot knowledge base.” N. Farriol-Mathis, J.S. Garavelli, B. Boeckmann, S. Duvaud, E. Gasteiger, A. Gateau, A.-L. Veuthey and A. Bairoch (2004) Proteomics 4 (4), 1537–1550 [PMID:15174124]. “ProSight PTM: an integrated environment for protein identification and characterization by top-down mass spectrometry.” R.D. LeDuc, G.K. Taylor, Y.B. Kim, T.E. Januszyk, L.H. Bynum, J.V. Sola, J.S. Garavelli and N.L. Kelleher (2004) Nucleic Acids Res. 32 (), W340–W345 [PMID:15215407]. “Autumn 2005 Workshop of the Human Proteome Organisation Proteomics Standards Initiative (HUPO-PSI) Geneva, September, 4-6, 2005.” S. Orchard, H. Hermjakob, C. Taylor, P.-A. Binz, C. Hoogland, R. Julian, J.S. Garavelli, R. Aebersold, and R. Apweiler (2006) Proteomics 6, 738–741 [PMID:16411267]. “Proteomics and Beyond: a report on the 3rd Annual Spring Workshop of the HUPO-PSI 21-23 April 2006, San Francisco, CA, USA.” S. Orchard, R. Apweiler, R. Barkovich, D. Field, J.S. Garavelli, D. Horn, A. Jones, P. Jones, R. Julian, R. McNally, J. Nerothin, N. Paton, A. Pizarro, S. Seymour, C. Taylor, S. Wiemann, H. Hermjakob (2006) Proteomics 6 (16), 4439–4443 [PMID:16897683]. “The work of the Human Proteome Organisation’s Proteomics Standards Initiative (HUPO PSI).” C.F. Taylor, H. Hermjakob, R.K. Julian Jr, J.S. Garavelli, R. Aebersold, and R. Apweiler (2006) Omics 10 (2), 145–151 [PMID:16901219]. “A standard nomenclature for modifications encountered in the analysis of proteins by mass spectrometry.” S.L. Seymour, R.C. Beavis, P.-A. Binz, D.M. Horn, R.J. Chalkley, D. Suckau, L. Montecchi-Palazzi, J.S. Garavelli, J. Shofstahl, D.M. Creasy, and J.S. Cottrell (2006) 16th meeting of Methods in Protein Structural Analysis, Lille, France, August 29-September 2, abstract 83. “A standard nomenclature for modifications encountered in the analysis of proteins by mass spectrometry.” S.L. Seymour, R.C. Beavis, P.-A. Binz, D.M. Horn, R.J. Chalkley, D. Suckau, L. Montecchi-Palazzi, J.S. Garavelli, J. Shofstahl, D.M. Creasy, and J.S. Cottrell (2006) HUPO 2006, Long Beach (USA), Oct-Nov.
“The Universal Protein Resource (UniProt).” The UniProt Consortium (2007) Nucleic Acids Res. 35 (Database issue), D193-1977 [PMID:17142230]. “‘Good Annotation Practice’ for Chemical Data in Biology.” K. Degtyarenko, M. Ennis, and J.S. Garavelli (2007) In Silico Biology 7 (2 Suppl. ), S45–S56 [PMID:17822390]. “Interpreting sequences from mastodon and T. rex.” J.M. Asara, J.S. Garavelli, D.A. Slatter, M.H. Schweitzer, L.M. Freimark, M. Phillips, and L.C. Cantley (2007) Science 317 (5843), 1324–1325 [PMID:17823333]. “The PSI-MOD community standard for representation of protein modification data.” L. Montecchi-Palazzi, R. Beavis, P.A. Binz, R.J. Chalkley, J. Cottrell, D. Creasy, J. Shofstahl, S.L. Seymour and J.S. Garavelli (2008) Nat. Biotechnol. 26 (8), 864–866 [PMID:18688235]. “The Universal Protein Resource (UniProt).” UniProt Consortium (2008) Nucleic Acids Res. 36 (Database issue), D190–D195 [PMID:18045787]. “Missing in Action: Enzyme Functional Annotations in Biological Databases.” N. Furnham, J.S. Garavelli, R. Apweiler, and J.M. Thornton (2009) Nat. Chem. Biol. 5 (8), 521–525 [PMID:19620987]. “The Universal Protein Resource (UniProt) 2009.” UniProt Consortium (2009) Nucleic Acids Res. 37 (Database issue), D169–D174 [PMID:18836194]. “The Universal Protein Resource (UniProt) in 2010.” UniProt Consortium (2010) Nucleic Acids Res. 38 (Database issue), D142–D148 [PMID:19843607]. “UniProt Knowledgebase: a hub of integrated protein data.” M. Magrane, UniProt Consortium (2011) Database (Oxford) 2011, bar009. [PMID:21447597]. “Reorganizing the protein space at the Universal Protein Resource (UniProt).” UniProt Consortium (2012) Nucleic Acids Res. 40 (Database issue), D71–D75 [PMID:22102590]. “Ribosomally synthesized and post-translationally modified peptide natural products: overview and recommendations for a universal nomenclature.” P.G. Arnison, M.J. Bibb, G. Bierbaum, A.A. Bowers, T.S. Bugni, G. Bulaj, J.A. Camarero, D.J. Campopiano, G.L. Challis, J. Clardy, P.D. Cotter, D.J. Craik, M. Dawson, E. Dittmann, S. Donadio, P.C. Dorrestein, K.D. Entian, M.A. Fischbach, J.S. Garavelli, U. Göransson, C.W. Gruber, D.H. Haft, T.K. Hemscheidt, C. Hertweck, C. Hill, A.R. Horswill, M. Jaspars, W.L. Kelly, J.P. Klinman, O.P. Kuipers, A.J. Link, W. Liu, M.A. Marahiel, D.A. Mitchell, G.N. Moll, B.S. Moore, R. Müller, S.K. Nair, I.F. Nes, G.E. Norris, B.M. Olivera, H. Onaka, M.L. Patchett, J. Piel, M.J. Reaney, S. Rebuffat, R.P. Ross, H.G. Sahl, E.W. Schmidt, M.E. Selsted, K. Severinov, B. Shen, K. Sivonen, L. Smith, T. Stein, R.D. Süssmuth, J.R. Tagg, G.L. Tang, A.W. Truman, J.C. Vederas, C.T. Walsh, J.D. Walton, S.C. Wenzel, J.M. Willey, W.A. van der Donk. (2013) Nat. Prod. Rep. 30, 108-160 [PMID:23165928]. “Update on activities at the Universal Protein Resource (UniProt) in 2013.” UniProt Consortium (2013) Nucleic Acids Res. 41 (Database issue), D43-47 [PMID:23161681]. “Activities at the Universal Protein Resource (UniProt).” UniProt Consortium (2014) Nucleic Acids Res. 42 (Database issue), D191-198 [PMID:24253303].